We use and disclose health information about your child for treatment, payment, communication with contributing healthcare providers and healthcare operations. You may give us written authorization to disclose health information to anyone for any purpose; in addition, any authorization may also be revoked in writing. We will need written permission before any health information is disclosed to any caregivers besides the child’s legal guardian. In the event of an emergency we will disclose information based on our professional judgment. If we!suspect a possible abuse, neglect, or domestic violence we may disclose your child’s health information, as the law requires. Access: You have the right to look at or get copies (charge for copies and postage if mailed) of your health information. Restriction: You have the right to request that we place additional restrictions!on our use of disclosure of information. Alternative/Communications: You have the right to request that we communicate with you about your health history in alternative means. Amendment: You have the right to request that we amend your health information. We may deny your request under certain circumstances. Questions may be directed to our office manager. Violation of privacy rights, disagreement regarding access to health information or failure to respond to a request to amend or restrict disclosure of health information may be reported to the U.S. Department of Health and Human Services. Payment at time of service: It is our policy that payment is due at the time of service. We accept cash, checks, credit cards (MasterCard, Visa and Discover) and CareCredit (for those who qualify) as payment. Parents Legal Guardians bringing the child to our office are responsible for payment of all charges. We cannot send statements to other persons. Insurance: We accept dental insurance as payment and will assist in the preparation and filing of your claim; however, full payment will be required at time of service. Please present dental insurance card to the front desk before treatment. As a third party to the insurance transaction, we cannot guaranty payment based on the estimate of benefits, however, we will make every effort to file your claims and pursue payment in a timely manner. Fillings: Our dental material of choice is a toothRcolored plastic filling (composite resin). Please be aware that your insurance company may reimburse only at the level of a silver (amalgam) filling, and as such, the difference will be your responsibility. Behavior Management: procedures required to complete treatment in a safe and efficient manner will be assessed on an individual basis. Nitrous Oxide (Laughing Gas): Nitrous oxide is rarely covered by dental insurance; therefore, full payment for this service will be collected on day of treatment. IV Sedation: The full sedation fee will be required 2 weeks prior to sedation appointment and will not be reimbursed if patient fails to show at the scheduled time. Please be aware that treatment may change on day of service and parents will be accountable for additional fees, if any. Emergency Treatment: Emergency treatment must be paid in full at the time the service is rendered. Collections: Please note that any unpaid balance will be referred to a collections department within 90 days. If we have to submit your account to a collection agency, all fees incurred will be passed on to you. In addition, any bounced checks not reconciled will be sent to the State Attorneys Office. Parents legal guardians have the responsibility to provide a complete health dental history to include allergies, current medications and emergency room visits hospitalizations. We strive to establish cooperation and trust between our staff and your child. Parents are welcome to accompany their child into the treatment area during all appointments, except for IV sedation, as this gives you the opportunity to see our staff in action. We also ask that siblings remain in the reception room or play area so that we may fully focus our efforts on the patient. There may be times when a child’s experience is enhanced by a parent’s absence and as such, we encourage older children (i.e. 6 years or older) to come back to the treatment area by themselves to promote autonomy and confidence. Also, older children who are apprehensive may look for an “escape” by going to their parents. In this case, we may ask the parent to wait in the reception room during treatment to facilitate a more direct line of communication between the child and doctor. Photographs of the patient may be taken for diagnostic and or educational purposes. We would like the opportunity to use photographs testimonials to support our practice in ads, pamphlets, websites, mailings and other forms of communication. If you decline, please furnish us a written statement that will be placed in your file for future reference. If your child is under the age of 6, we ask that you schedule a morning appointment since younger children cooperate better for exams and treatment when they are well rested. When a patient does not show up on time for an appointment, or cancels with less than 24 hours notice, a $50 fee will be charged. We will make every attempt to confirm the appointment 48 hours prior. This fee must be paid before a new appointment is scheduled. After two missed appointments, it will be at the doctors’ discretion to schedule additional appointments. We utilize the most effective infection control measures and fully comply with the new OSHA standards for sterilization. We maximize our use of disposable material and sterilize all of our hand instruments. I have had a chance to read and understand the Office Policies and agree to abide by their content. 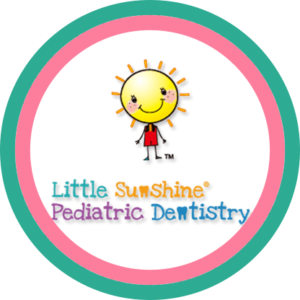 Copyright © Little Sunshine Pediatric Dentistry. All Rights Revserved.